You are here: Home / Technology / what’s different between electric conductive casters and anti-static casters? 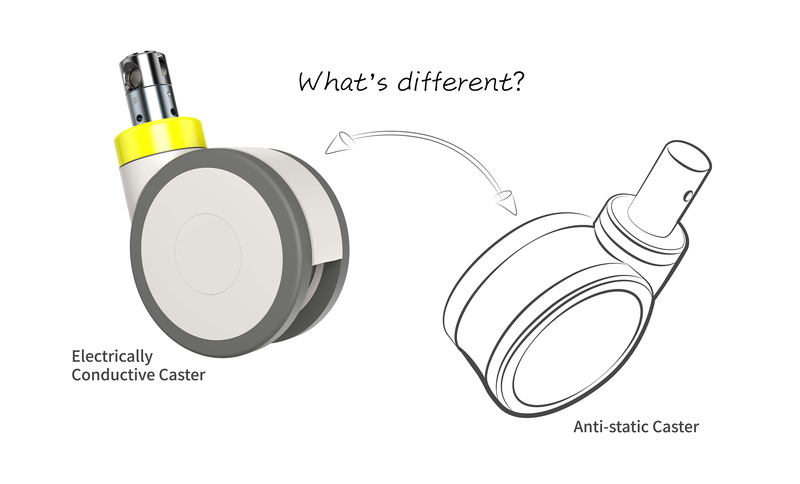 what’s different between electric conductive casters and anti-static casters? Generally speaking, the most common way to distinguish electric conductive casters and anti-static casters is by their resistance. The resistance of the electric conductive caster usually between10e4Ωand10e6Ω, and the resistance of anti-static caster between10e6Ωand10e8Ω, both of them can avoid electrostatic hazards. But in the narrow sense, the real difference between the two is the principle of its operation. The electric conductive casters mainly eliminate static electricity by transferring current, even if the casters generate static electricity while rolling, it can remove static electricity instantly; the anti-static casters mean that when the wheel rolling on the ground, it won’t generate more than 250 voltage, that is to prevent static electricity generation and aggregation, for solving the problem of electrostatic hazards. The hospitals or the electronics factories that have precision instruments must install devices to remove static electricity. If there is no anti-static precaution, static electricity may make the instruments lose the function or short circuit, cause the operator electrical damage, even the serious electrostatic hazards. Thus, the electric conductive caster and anti-static caster play a very important role. Although both can eliminate static electricity, their efficiency is still different. Electric conductive caster eliminates static electricity by transmitting current, it can remove the static electricity generated on the instrument and the caster; Anti-static caster mainly prevents the generation of electrostatic ions, it can only eliminate the static electricity on the casters, the effect of eliminating the static electricity on the instruments will be relatively lower. In order to provide the highest quality, TKS designed the resistance of electric conductive caster all below 10e4Ω.Therefore the elimination of static electricity can be more efficient, reducing the risk of electrostatic disasters.